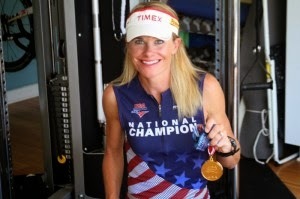 Recently I had the privilege to interview Timex Multisport Team member Susanne Davis. Susanne is a decorated athlete who has set course records and won many Sprint Distance Triathlons. As a Professional Triathlete in the 1990s, she travelled the world racing ITU World Cups and competed in the 2000 US Olympic Triathlon Trials. In October 2010, in only her second Ironman, she turned Kona upside down by breaking the existing 35-39 Age Group World Record and placing 2nd Overall Amateur at the 2010 Ironman World Championships. She was the 1st American Woman and placed 23rd among the Pro Field! This year in 2013 Susanne put in one of the greatest races of her life. She is now an American record holder being the fastest Amateur over 40 in the 35 year history of the Ironman World Championship going 9:41:40. 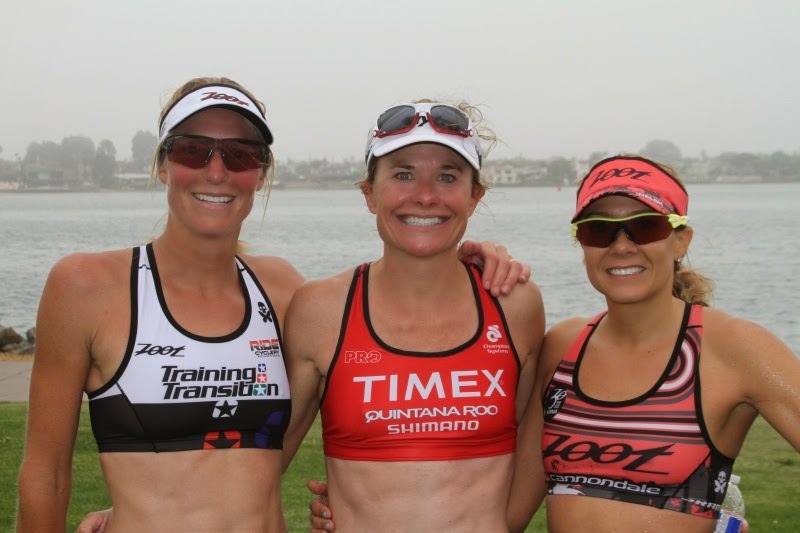 She is also the reigning 2013 USA Triathlon Masters Champion at Olympic Distance. She finished the year as the number one ranked Master’s triathlete in the country. 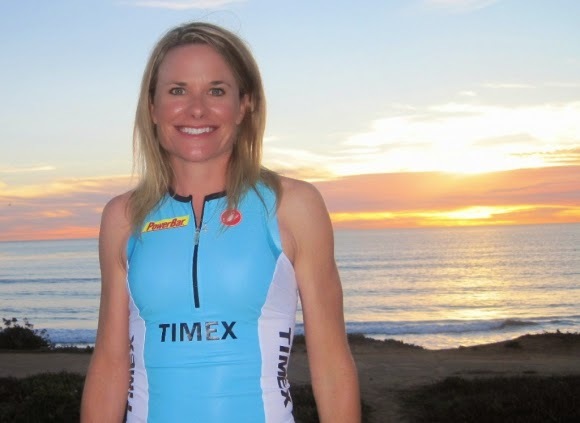 In 2011 during her first year on Timex Multisport Team, one of the country’s most successful triathlon teams, Susanne was voted Rookie of the Year. RD: Tell us a little about your youth. Were you athletic as a child? Did you grow up in an athletic family? Susanne: I grew up running track and cross country in High school and College at University of Wisconsin LaCrosse. I am the youngest of 6 kids and my sister Beth who is closest in age to me (5yrs older) was my biggest influence. I went to her meets and loved the camaraderie and team spirit. Her coaches would always come up to me and say, "I hope you are a runner because you've got those long, lean, fast "Martineau legs"." That invitation and wanting to be as good or (actually better) than my sister was my motivation. I always was competing to keep up with her growing up. Water skiing, down hill skiing, mountain biking, running, swimming faster across the lake each year camping etc. It makes me laugh and wonder if my daughter who is 5 years younger than my son if this will play out in her life. Her personality is a lot like me. RD: When did you first realize that the triathlon and more specifically the Ironman was your niche? Susanne: I did my first triathlon in summer of 1993. I was almost last out of the water, road past half the field on a borrowed bicycle and ran very strong passing tons of people to the finish! I had no idea but at the awards ceremony they announced me as the winner and gave me a check for $100.00! I was shocked and elated. This is where my dream started and ironically the motto of Ironman, "Anything is Possible". I thought, wow I can make money at this? I won this triathlon on my first attempt! I think I could be one of the best anywhere! Being 22 years old and a bit naive has it's advantages. Here I was from a town of 12,000 people where I beat 150 of them. It didn't dawn on me that the world has 7 billion people. I read in Triathlete Magazine that the best athletes trained in Boulder so I moved there for the summer to become one of the best triathletes! I took 30 minutes off my next triathlon and in my senior year of college I won almost every NCAA cross country race. It was from the strength and speed I earned simply from doing triathlon for 3 months. I was convinced triathlon was something I should pursue. I became the top Triathlete in the state of Arizona and was invited to live and train at the Olympic Training Center as a resident athlete training for the first Olympic Games in Sydney, Australia in 2000. My swim wasn't strong enough to make it out of the water in the lead pack and with drafting on the bike it made it impossible for me to catch up and finish 1st or 2nd which is how you qualified. I was burned out and took a 3 year break from triathlon. I went back to running and balanced it around a sales rep job. RD: How does being a triathlon competitor in the 90s compare to being an Ironman competitor in 2014?Susanne: Ironman didn't become my niche until I had children. I gained 50 lbs with my first son and worked as a Sales Rep traveling on the West coast for 60 hours a week. I cried everyday I had to leave my son to drive to LA. I quit and a neighbor/CEO asked me to coach him for an Ironman. He didn't know how to swim, never biked and hadn't run since college. I trained with him and lost the weight. I decided to try a half ironman, qualified for Kona and placed 11th amateur overall and 3rd in my AG 30-34. 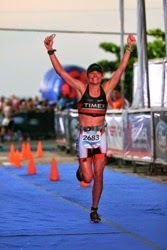 Not until 5 years later after having my second child did I realize Ironman would be my niche! I grew my coaching business and trained with many of my clients. It was the perfect environment to light the Kona fire in me again. I was 3rd overall with the pros in my qualifying race at Honu! At Kona, I was the top American amateur in the World Championships and 2nd Overall Amateur. 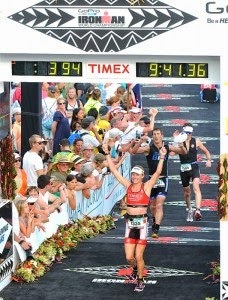 I had beat my existing age group World Record and taken 30 minutes off my previous Kona time finishing in 9:51! What!? It was then in 2010, 17 years after my first triathlon that I thought I found my niche. God gave me a taste of success and I believed I could get faster and become the best in the World. RD: What was your toughest race? What made it so tough? 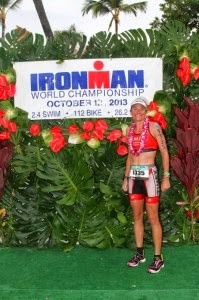 Susanne: Last year at the Ironman World Championships. I was on fire from the start swimming 90 seconds faster than my previous years, biked 11 minutes faster and was stoked going into the run which is my strongest leg of a triathlon. But, at mile 2 my pace slowed from 7:15 to almost 9 minutes as my hips and glutes were locked and not firing. No uphill to blame. I thought OK, my body will be OK it just needs another mile to stretch out from the ride, but every step hurt. My husband screamed, "Banana (Susanna banana) nick name) you are going to CRUSH the world record! For the past two years I've run 3:17 or 3:18 off the bike. I yelled back, " I'll be lucky if I break 3:45 today". It's going to take all I've got. I chanted the names of people I loved and who supported me and sang songs of faith, "He can move the mountains, my God is mighty to save... Please lord move this mountain of pain and slow running. Then at the Energy lab, "Eye of the Tiger came blasting through the only speaker on course. Rising up back on my feet. I pumped my fist in the air, yelled out let's get this party started and boom - I took the pace back down to 7:30 pace! RD: What's a typical training week look like for you? Susanne: Monday my alarm goes off at 4:20am. I make a double shot cappuccino and teach YMCA 90 minute spin class at 5:15am. I run home, make breakfast, pack lunches and at 8am I drop my kids at school. I go for a run and start coaching athletes or write programs on Training Peaks all day until I pick my kids up from school at 2:20pm. I make a snack, do homework, make dinner, read with them, go to bed and start again! Tuesday I have an off day and coach people and catch up on daily house or mom duties. I also teach math as a volunteer in my daughters class. Wednesday is my mid-week long ride with a run after it. Thurs is speed day. I do a speed set running in the morning, coach personal sessions and swim Masters over lunch. Friday I teach another Spin class at 5:15am, then run or swim. Sat: My husband watches the kids and I ride 4 hours and run off the bike. Sunday: is a family day, church and off or a long run. I'll squeeze in extra swims throughout the week to make sure I'm swimming 4 times just before Ironman. All of my mileage and paces vary throughout the year based on what phase of periodization I'm in. RD: What tools do you use to help elevate your training. Susanne: I train with a Timex Run Trainer 2.0 Heart Rate and GPS monitor. I'm a big believer that numbers are important and provide needed guidance in training. Every workout is written with a specific goal of heart rate and pace. I maximize my time, effort and benefit from the training at the highest level. I also use rpms and watts as well to control anaerobic efforts at race pace when teaching spin class as a turbo session weekly. All these numbers can be pretty important on race day. RD: You're also an endurance coach. How does the time commitment of training others affect your Ironman training? Susanne: Certainly the time could get away from you easily and some weeks it's very challenging to balance. I am very good at organizing a calendar. Many of my clients who I coach are with me for years and they understand the complexity of balancing time with other commitments. I coordinate some long Sat rides with clients who are around the same strength. It's a benefit to us both. I do group sessions the last two months leading up to a big Ironman race. I also limit how many clients I personally work one on one with so I can keep balanced. I've hired a few amazing assistant coaches who know my philosophy in coaching and are experts as well in different areas of training. I love my daughter's saying, "mom I'm not an octopus". I have to remind myself of that when I'm over commit myself. RD: Have you ever pictured yourself doing something different with your life? Susanne: No! I love my life! I love my family, friends, where I live, my job as a coach and the Timex Team. I feel so blessed to be where I am. RD: What do you enjoy most about coaching others? Susanne: I love to share my knowledge and see the light click, the confidence build and the results improve. The appreciation and accolades I get from my clients goes full circle. I inspire them and push them to be better and they do that for me. Qualifying for Boston the Kona Ironman or getting on a podium is a life long journey for some. Watching them get there and knowing I'm part of the reason is seriously rewarding. They cheer for me as aggressively as I cheer for them. Many have become lifetime friends. RD: Looking back over your athletic career, what would you do differently? Susanne: I would have raced Ironman much sooner. I went 9:51 at the age of 39 in my first real effort to perform there. If I think back, a young Kate Major (a good friend) had a really successful career with several 3rd place finishes. She set an amateur world record just 2 minutes faster than my effort back when she was 23. I've looked at that and thought where could I have been if I started this Ironman journey in my early 20's. Unfortunately, I thought it was a crazy distance that I wouldn't even be able to handle. I think I could have been a fairly successful Pro at this distance over the Olympic ITU format. RD: How did it feel becoming the fastest amateur over 40 in the 35 year history of the Ironman Word Championship with your 9:41:40 finish time? Susanne: There were so many emotions. Surprise after my run start. Incredible satisfaction from the fight of the race. A thrill that I finally made the top of the podium. Relief as I'd chased this for the last 4 years. But mostly it was the sweetest ending to an extremely difficult year for my family. Triathlon has been a great stress reliever in my life through the years. I'm thankful I had it last year. RD: Are you hoping you hold on to your reign of the USA Triathlon Masters Champion title at the Olympic Distance for a while or would you be okay with someone edging you out? Susanne: Most races on my calendar I go into with the intention of winning. There are a few that are tune up races where I know I'm not in top form. This race is in Milwaukee and I'm surrounded by family so I certainly have a star next to it on my calendar. It's an "A" race for me and I will prepare myself (as I'm my own coach) to win again. I'm OK if someone edges me out on the day. I can control my preparation, but I can't control the day. You never know what is going to happen to your body or equipment on any given day. I do know that I will be fast and ready and I have a program that got me there last year. RD: How does competing at the masters level differ than when you were younger? What do you know now as a masters competitor that you wish you had known when competing in your 20s? Susanne: My confidence as a master's is what I didn't have racing as a Pro in my 20's. Then, you were only as good as your last race. If you didn't win money you didn't get to travel to the next competition and I was afraid I'd lose my sponsorships and disappoint many people in my life. Now I'm a mom, wife and coach. I also happen to be the top Master's triathlete in the world. Figuring out how to find this balance is so rewarding and if I don't win, I still feel the other rewarding parts of my life. My family still loves me if I'm 1st or 15th. It's always a win-win now. RD: What do you think about younger and younger kids (teens and pre-teens) competing in ultra-type endurance competitions? Susanne: Great question. I've coached elite Jr. High and High School runners and I've seen the difference between coaching philosophies and the other athletes on their team. The old adage of everything needs to be done in moderation couldn't be more true at a younger age. If a parent has a teenager with the passion to run a half marathon or a marathon then they should investigate coaches. Find a coach who can build them up gradually and help them cross train or do the right core strength to avoid over use injury and burn out. I've seen both sides of the coin. Athletes who were burned out, injured and didn't run again after high school. I've also seen my clients go on to have full ride scholarships and shine in college. A child's desire to be great is something you can't teach but comes from within. It's how you stoke that fire that makes the difference. RD: What are your future aspirations? Susanne: I feel like I've achieved everything I've wanted to achieve in the sport. That's not to sound conceited but I am satisfied with what I've done. The fire is still there and I will compete like I always have but do I have to be the top amateur or top 20 pro or set a world record in the 45 age group? For now, no. But ask me in a year. My focus now that I've reached the top is to share my knowledge and passion with more people. I will be growing my training business to help make a difference in more people's athletic life. I will continuing being a role model for my kids, clients, people over 40 and moms who want to achieve something great for themselves. Racing a marathon, a triathlon or cutting time off your next race is doable at any age. If you need help, find a coach like me. Some people think they can't achieve their dream or are overwhelmed. I say dream, plan and believe anything is possible. I know, because I just proved it. Be sure to checkout Susanne's website www.tricoachdavis.com. Stay Tuned! 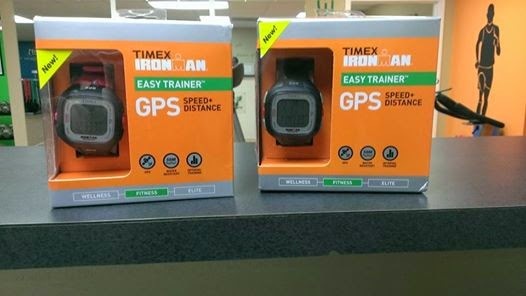 In honor of Susanne's great accomplishments, RunnerDude has partnered with TIMEX to giveaway two TIMEX Ironman Easy Trainer GPS watches! Look for more on the giveaway and how to enter for a chance to win one of two GPS watches this Monday! I was so impressed with the questions you asked of Susanne, and equally impressed with her answers. Susanne''s attitude and actions prove to me that she is not only an elite athlete, but a loving, focused, balanced wife, mother and friend. Her convictions and experience will make her the best coach anyone could retain.